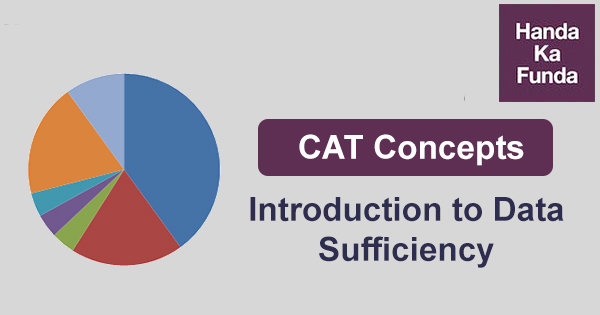 Data Sufficiency questions often involve very simple calculations. This does not mean that the questions are simple. It just means that the chances to make conceptual mistakes and / or silly mistakes are a little higher than usual. You will need to pay attention to detail in such questions. In Data Sufficiency, you need to figure out whether or not the data given in the question / statements is good enough to find out a unique answer. Once again – is the data enough to find out a unique answer? Let us look at a few simple questions to understand the concept in a better way. Please note that these questions are way too simple to be asked in an exam like CAT, but they are necessary for understanding the idea. Q1: What is the value of ‘x’? Q2 What is the value of ‘x + y’? Q3 What is the value of ‘x + y’? Q4 What is the value of x? From the first statement, I get the values of x as 2 & 3. I do not have a unique answer. From the second statement, I get the values of x as 2 & 4. I do not have a unique answer. Q5 What is the value of x? Q6 What is the value of x? From the first statement, I get the value of x as 3. I have a unique answer. From the second statement, I get the value of x as 4. I have a unique answer. Now some of you might be thinking that we have got a different answer from both the statements and so the answer is not unique. Well, that thinking is incorrect. We have to figure out whether or not the given data was sufficient. When I am looking at Statement A, I am just looking at Statement A. If I can get a unique answer from Statement A, I will not even bother with what is going on in Statement B.
Q7 Is ‘x’ a prime number? From the first statement, I get the values of x as 2 & 3. From the second statement, I get the values of x as 4 & 6. But that is not what the question is. The question is whether or not x is a prime number. My answers should not be values of ‘x’, they should be ‘Yes’ or ‘No’ or ‘Can’t Say’. So, let us calculate again. From the first statement, I get the values of x as 2 & 3. So, x is a prime number. I can answer the question and my answer is YES. From the second statement, I get the values of x as 4 & 6. So, x is not a prime number. I can answer the question and my answer is NO. You can also see:How to prepare for LRDI (Logical Reasoning and Data Interpretation) for the CAT 2019 Exam? I hope you would be comfortable with Data Sufficiency questions now. I would like to repeat that the questions mentioned above are on the simpler side and probably you should practice some real Data Sufficiency question to get a hang of the topic. Data Interpretation – Set 3: There were seven elective courses – El to E7 – running in a specific term in a college. Data Interpretation – Set 4: Funky Pizzaria was required to supply pizzas to three different parties. Data Interpretation – Set 5: Simple Happiness index (SHI) of a country is computed on the basis of three parameters: social support (S), freedom to life choices (F) and corruption perception (C). Answer should be unique from both the statements or from any of the statements to click on yes option ? In above we assume that from statement we get unique number or if not then how we say that above options.